Here we go all of you wonderful followers, and all of you wonderful stop-by-to-read oncers! A little sneak peak of answer number 6 from our first entry to our The Buffer Zone dysfunctional family member contest, sent to us by the lovely Luanna, http://www.sothislife.com. 6. Without naming names, who is the relative in your family that causes all the drama? And what incident best illustrates their craziness, “personality” or friction they bring to your family? Was it the time your great aunt slurped up the spaghetti she spilled down her blouse at your engagement party? When your grandfather got arrested after the family reunion for writing “The McMurty’s Rule!” in black spray paint on the rented hall, and then punching our the security guard? Or the holiday your cousin showed up drunk, did a semi-strip tease interpretive dance, and then slept with your husband? So Luanna has thrown it down. Now it’s your turn to explain, excuse, rat out, or vent about your dysfunctional family member. The question above (#6.) is the one we are all waiting to read, so you can send in the answer to only that question, along with a link to your blog, etc. if you wish, or answer all the questions in our survey http://wp.me/p3lORd-42 by e-mailing responses to thebufferzonesurvey@yahoo.com. 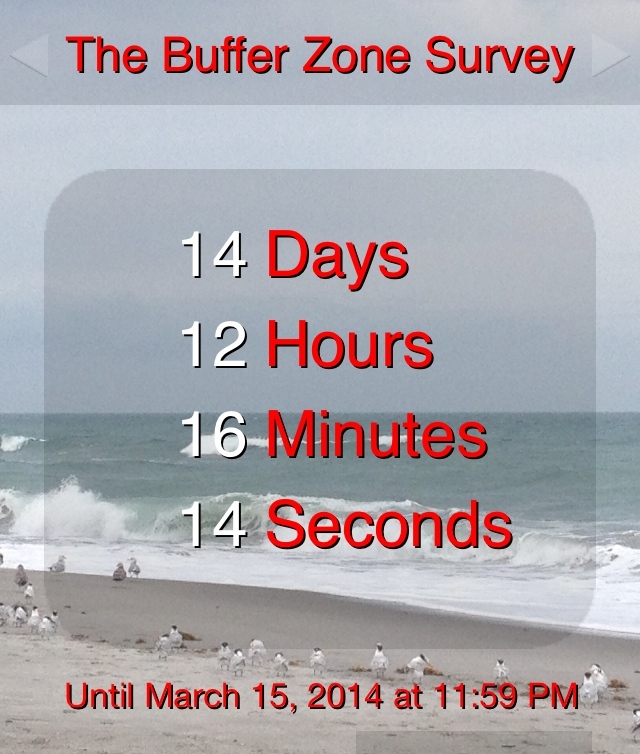 The contest ends at 11:59 EST on March 15, 2014. The rules are as follows: …uh, wait, there are no rules. We don’t care about grammar, punctuation, or even if it’s completely 100% true. Amuse us. This entry was posted in Uncategorized and tagged "Lifestyles, #blog, #blogging, #bufferzone, #community, #contest, #crazy, #culture, #dysfunctional, #family, #humor, #humour, #men, #Personality, #Psychology, #Society, #survey, #women, #writing, Drama by thebufferzoneday. Bookmark the permalink.